Martin Lloyd returns to the SGC with the news that his short-lived television series based on SG-1 will become "Wormhole X-treme: The Movie." At the request of General O'Neill, SG-1 grudgingly meets to give notes on the script to be certain that the Air Force is properly represented. However, from the opening sequence in which the homeworld of Ewok-like Furlings explodes, to an implausible escape from swarming Replicators, a Star Trek homage aboard the Prometheus, and the complete destruction of Cheyenne Mountain, the script is jam-packed with every science fiction cliché imaginable, not to mention the premise that explosions make better trailers. When a gate malfunction prevents the team from embarking on Mitchell's 200th trip through the stargate, SG-1 must remain with Martin, offering scenarios to resolve his budget cuts, cast negotiations, and studio visions of an SG-1 "Mod Squad." The mission in which O'Neill became invisible could provide a solution to a missing lead actor, or puppets could exist in a parallel universe. Mitchell proposes an attack by zombies, Teal'c suggests "Teal'c P.I.," and Vala pitches story ideas from "The Wizard of Oz," "Gilligan's Island," and the more obscure "Farscape." As they contemplate a plot twist that no one will see coming, General O'Neill arrives at the SGC. Martin needs a new movie ending to appease the focus groups. Vala suggests that everyone loves a wedding, but O'Neill insists that the team should go fishing, since anything after that would seem pointless. 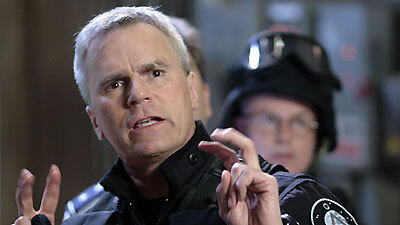 However, the script spinning ends when the stargate is repaired, and O'Neill, Landry, and even Sgt. Harriman accompany SG-1 on Mitchell's 200th trip through the gate, where cake, balloons, and streamers await. Meanwhile, Martin receives word from the studio that the movie has been canceled, but the series has been renewed instead, a series that will last for 10 years and 200 episodes before spawning yet another movie. It seems art imitates life. Reference: Doug Anderson, Director, Furlings, Raymond Gunne, Invisibility, Martin Lloyd, Gavin Marlowe, Jack O'Neill, P2C-106, Yolanda Reese, Scotty, Sergeant Siler, Wedding Guests, Wormhole X-treme! The "Wormhole X-treme" series only lasted for three episodes, but it allegedly performed well on DVD. Martin Lloyd was given the go ahead to write and produce "Wormhole X-treme: The Movie" for television, which was canceled at the last minute, and the series was picked up again. Eventually the series will last for ten seasons, 200 episodes, earning 7 Saturn Awards for best cable or syndication science fiction show, after which the movie is picked up again. Raymond Gunne left "Wormhole X-treme" temporarily. His fan campaign included an ad in Variety and savedrlevant.com which got dozens of hits a month. Nick Marlowe left "Wormhole X-treme" after eight seasons, after which the part of Colonel Danning was played by Gavin Marlowe. When O'Neill was in the engine room of a mothership, standing right next to the cloaking generator as it was turned on, he was bombarded by the particle field being emanated by the cloaking generator. He became invisible, and he liked it. There have been 1263 mission files. Mitchell was born in 1970. Mitchell's 200th trip through the stargate is to P2C-106 where SGs 3 through 18 are waiting with cake, balloons, streamers, the works. Chief Master Sergeant Walter Harriman officially steps through the stargate. The power is getting to the flux capacitor, but the feedback is not feeding back into the feedback face. Can you reverse the… polarity? I'm being Punk'd, aren't I? Maybe we can have puppet O'Neill jump over a puppet shark on a one-third scale motorcycle. Trust me. Jeopardy plus ticking clock is box office. It's the E=mc2 of the entertainment world.